All roads lead to Newry on Sunday afternoon as the RGU Seniors start their Championship campaign against the holders Kilcoo writes John Murphy. The RGU Minors won their Championship match against An Riocht. The match throw in is at 3.30pm in Pairc Esler and we would urge all supporters to come down and get behind the lads. We wish them well and hope that they can perform to their undoubted ability.. They got their preparations of to a good start with a 7 pointwin over An Riocht last Fri night at PTR. U-14’s were desperately unlucky against Carryduff in the first round of the Championship as they conceded a last gasp penalty to lose by a point. 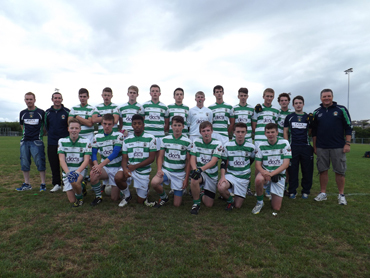 The Minors got of to a great start in their Championship with a 2 pt win over An Riocht. Matches this week, the U16s are at home to Rostrevor on Thur, U12 Girls are away to Saul tonight at 7.30 whilst the U-12 Boys are away to Bredagh tonight also. U-12’s play on Sun at home to Carryduff and the U-14 Girls travel to Tullylish. The U-8’s host their home tournament this Saturday at PTR. 16 teams from Down and Armagh will fight it out for the Cup and the Shield. 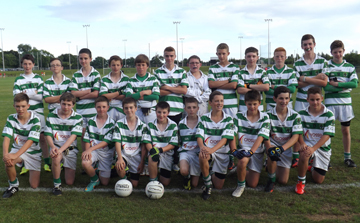 The RGU U-14 squad who played against Breda on Monday evening. The U-6’s back training on Sat morning along with the U-8s and U10s at 10.30am. The U-8’s also train at 6pm on Wednesday evening and the U-10’s also on Thursday at 7pm. Tickets are now on sale for the Wolfe Tones. They are coming to the club on 24 August – tickets cost £20. There will be a range of other events on the August Bank Holiday weekend – details to be confirmed. A Zumbathon will be held on 22 August as part of the RGU Festival at the Marquee Weekend, with a donation going to the Declan McMullan Fund Contact Edel on 07759418419 for tickets.